This artist's concept depicts NASA's Phoenix Mars Lander a moment before its planned touchdown on the arctic plains of Mars in May 2008. NASA's Phoenix Mars Lander reachedout and touched the Martian surface for the first time with the scoop at theend of its robotic arm on Saturday, leaving a "footprint" in thesoil. This "soil touch," as mission scientists call it is the firststep toward diggingfor soil and ice samples with the robotic arm. "This first touch allows usto utilize the Robotic Arm accurately. We are in a good situation for theupcoming sample acquisition and transfer," said David Spencer, Phoenix's surface mission manager from NASA's JetPropulsion Laboratory in Pasadena, Calif. The impression left in the soilwas photographed by the lander's stereo camera. The spot where the slight dentwas left has been provisionally named "Yeti" (the team is using namesfrom fairy tales and folk lore to designate the surface features around the landingsite). Click here for SPACE.com's NASA TV feed or herefor an archive of SPACE.com?s Phoenix mission coverage. On Friday night, missionscientists received animage back from Phoenix of its underbelly that further suggest the lander exposed a layer of rock-hard ice when it landed onthe Martian surface. The spacecraft maneuvered itsrobotic arm to take another image of the surfaceunderneath it, which showed patches of smooth and level surfaces just underthe thrusters that slowed the craft down as it approached the surface duringits landinglast Sunday. "We were expecting to findice within two to six inches of the surface," said Phoenixprincipal investigator Peter Smith of the University of Arizona. "The thrusters have excavated two to six inches and, sure enough, we seesomething that looks like ice. It's not impossible that it's something else,but our leading interpretation is ice." NASA?s Phoenix Mars Lander has successfullymoved its robotic arm for the first time, mission managers said in a lateWednesday status update. Clickhere for a new image from Phoenix that shows the movement of the arm?selbow. Phoenix released the protective latchesthat secured the 7.7-foot (2.3-meter) robotic arm during launch and landing, then moved it up and off of a holding pin on the top of the lander. The move is the first stage of a planned two-dayprocess to completely deploy the robotic arm. Phoenixlanded on the flat plains of Vastitas Borealis inthe Martian arctic late Sunday to begin a three-month to study subsurfaceMartian water ice. The $422 million mission is aimed at determining whether theregion could have once been habitablefor primitive life. A mission status briefing isexpected to air live on NASA TV from Phoenix?smission control center at the Universityof Arizona in Tucson today at about 2:00 p.m. EDT (1900GMT). NASA will broadcast Phoenix?s mission updates on NASATV. Click herefor SPACE.com's NASA TV feed or herefor an archive of SPACE.com?s Phoenix mission coverage. NASA?s Mars Reconnaissance Orbiter(MRO) was able to successfully receive information from the Phoenix Mars Landeron Tuesday evening after going into standby mode earlier that day for a stillunknown cause, NASA announced on Tuesday. The transmission included imagesand other information from the lander after itssecond day on Mars. The glitch with MRO?s radioantenna had prevented mission controllers from sending any new instructions to Phoenix on Tuesdaymorning, but the lander carried out a series ofbackup commands instead. NASA?s Mars Odyssey Orbiter is scheduled to send Phoenix a new set ofcommands on Wednesday morning. NASA?s PhoenixMars Lander is in good health, though a glitch ? the first snag of itsmission ? has prompted the radio on one of the probe?s relay craft to shutdown, mission managers said Tuesday. The radio on NASA?s Mars Reconnaissance Orbiter (MRO), whichcommunicates with Phoenix,has shut itself off due to an unknown problem, but the landeritself appears to be in fine shape, mission managers said today in a dailybriefing. MRO is one of several spacecraft orbiting Mars that canserve as a relay between Phoenixand Earth. NASA?s Mars Odyssey and Europe?sMars Express can also serve as relays for the probe, which landedon the red planet late Sunday. Mission scientists also released new images of Phoenix sitting on itsMartian arctic landing site as seen by MRO. A wrap up of today?s Phoenixbriefing will be posted to the SPACE.com home page shortly. Last night, Phoenix mission scientists received dozensmore raw images of the Martian arctic surface and the spacecraft itself afterlinking up with NASA?s Mars Odyssey Orbiter. The images and new data beamedback from the lander show that it was in good healthafter its first night on Mars. A mosaic image on NASA?s Phoenix mission pageshows a portion of the lander?s solar array, part ofthe lander deck, and some of the terrain around thelanding site. Over the next few days, mission scientists will image more of thelander to make sure its instruments are in goodcondition. They will also be taking a 360-degree panorama of the landing site. A NASA orbiter caught a snapshot of the Phoenix MarsLander?s descent as it drifted toward a successfulSunday landing under its parachutes, mission managers said Monday. The Mars Reconnaissance Orbiter captured images of Phoenixdangling from its parachute during the probe?s seven-minute plunge toward thenorthern polar region of Mars. ?This is an engineer?s delight,? Phoenix project managerBarry Goldstein said in a mission update today at NASA?s Jet PropulsionLaboratory in Pasadena, Calif. ?When this was first proposed, I was veryskeptical.? In the new black and white image unveiled today, Phoenix?s parachute is clearlyvisible as a white blotch, which is connected to the spacecraft itself viafaint lines. Phoenix landed successfully late Sunday inthe Vastitas Borealis region of Mars, with missioncontrol at JPL receivingits first signal from the spacecraft at about 7:53 p.m. EDT (2353 GMT). Theprobe later senthome its first images indicating its solar arrays were deployed andunveiling the first views of the Martian arctic. Clickhere for SPACE.com?s account of the Phoenix landing. The first images of the Martian arctic are streaming into NASA?sPhoenix Mars Lander control room, prompting cheers and applause as thephotographs come in. In the images, Phoenix?stwo fan-like solar arrays are visibly deployed. Other photographs show one ofthe spacecraft?s footpads, which engineers will use to see how deep Phoenix sunk into theMars surface after landing. Other images show the Mars horizon off in thedistance. ?It looks as if the solar arrays have completely deployed,absolutely beautiful,? said Dan McCleese,chief scientist at NASA?s Jet Propulsion Laboratory in Pasadena, Calif.?It?s just beautiful, crystal clear images.? ?These images are telling us we?ve got a healthyconfiguration for the spacecraft,? he said. Clickhere for SPACE.com?s account of tonight?s landing. Clickhere for aguide of NASA?s Phoenixmission coverage this weekend. NASA willbroadcast Phoenix?smission updates on NASA TV. Click herefor SPACE.com's NASA TV feed or here foran archive of SPACE.com?s Phoenix mission coverage. NASA engineers and scientists are going over the first batchof data from the Phoenix Mars Lander via the Mars Odyssey and ReconnaissanceOrbiters circling the red planet after tonight?ssuccessful landing. Clickhere for alook inside the mission control room at NASA's Jet Propulsion Laboratory afterlanding confirmation. Phoenix appears to have landed as expected,though its parachute opened about seven seconds later than initially planned.So far, the spacecraft?s systems appear to be functioning well. Engineers are eagerly looking forward to a newcommunications pass, which should return more data that they hope will confirmthat Phoenix has successfully deployed its vital solar arrays that will powerits three-month mission.
? ?We will takepictures of the solar panels first to make sure they?ve deployed properlybecause that?s our life support system,? said Phoenixprincipal investigator Peter Smith of the University of Arizona. 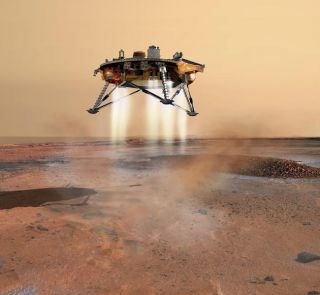 With NASA?s Phoenix Mars Lander?s apparentlysuccessful landing on the arctic Martian plains, mission managers arepreparing for the next major milestones. Since landing, Phoenixshould have deployed its vital solar arrays, but the spacecraft is out ofcommunications range with NASA spacecraft circling Mars that serve its relay toEarth. A post-landing poll is expected to be conducted shortly, with live NASAcommentary to resume atabout 9:30 p.m. EDT (0130 May 26 GMT). ? -- Begin opening solararrays (during radio silence) 5:13 p.m.
-- Begin NASA's MarsReconnaissance Orbiter playback of Phoenixtransmissions recorded during entry, descent and landing, 5:28 p.m. However,data for analysis will not be ready until several hours later. -- Begin Europe's MarsExpress spacecraft playback of Phoenixtransmissions recorded during entry, descent and landing, 5:30 p.m. However,data for analysis will not be ready until several hours later. -- Mars Odyssey"bent-pipe" relay of transmission from Phoenix, with engineering dataand possibly including first images, 6:43 to 7:02 p.m. Data could take up toabout 30 additional minutes in pipeline before being accessible. If all goeswell, live television feed from control room may show first images as they arereceived. The first images to be taken after landing will be of solar arrays,to check deployment status. NASA will resume live coverage of the landing at about 9:30 p.m.EDT (0130 May 26 GMT). TOUCHDOWN! Phoenix Lands on Mars! NASA?s Phoenix Mars Lander has apparently successfullysurvived the descent to Mars and has landed on the planet?s arctic plains. "Phoenix has landed! Phoenix has landed!" shouted a NASAcommentator. ?Welcome to the northern plains of Mars!" Mission controllerserupted into applause and cheers, trading smiles and hugs as they received thesignal that Phoenixset down on the broad flat plains of VastitasBorealis on Mars. At times, mission engineers audibly celebrated the fact that Phoenix landed on terrainwith just a quarter-degree of tilt. ?In my dreams, it could not go as perfectly as it didtonight," Phoenixproject manager Barry Goldstein said after landing. "We went right downthe middle." Engineers and missionoperators here are pointing to their computer screens, huddled together andlooking at data lines intently. Touchdown and hugs allaround. Phoenixhas landed! Clickhere for SPACE.com?s preview of tonight?s landing. NASA will broadcast Phoenix?s mission updates on NASATV. Click herefor SPACE.com's NASA TV feed or here foran archive of SPACE.com?s Phoenix mission coverage. NASA?s Phoenix Mars Lander has entered the Martianatmosphere to begin the 7-minute plunge for landing. ? -- Likelyblackout period as hot plasma surrounds spacecraft, 4:47 through 4:49 p.m.
-- Parachute deploys,4:50:15 p.m., plus or minus about 13 seconds. -- Heat shieldjettisoned, 4:50:30 p.m., plus or minus about 13 seconds. -- Legs deploy, 4:50:40p.m., plus or minus about 13 seconds. -- Lander separates frombackshell, 4:53:09 p.m., plus or minus about 46seconds. -- Transmission gapduring switch to helix antenna 4:53:08 to 4:53:14 p.m.
-- Descent thrustersthrottle up, 4:53:12 p.m.
-- Constant-velocityphase starts, 4:53:34 p.m., plus or minus about 46 seconds. -- Touchdown, 4:53:52p.m., plus or minus about 46 seconds. NASA?s Phoenix Mars Lander has successfully jettisoned thecruise stage that has served as its lifeline during the 422 million mile trekto Mars. Seconds later, the spacecraft began beaming entry and landing databack to Earth via a relay through NASA?s Mars Odyssey spacecraft. Mission controllers at NASA?s JetPropulsion Laboratory let loose a brief round of applause and cheers to markthe milestone?s success. The spacecraft is due to enter the Martian atmosphereat 7:46 p.m. EDT (2346 GMT). Mission controllers hope to receive theirfirst signal from the spacecraft from the Martian surface at 7:53 p.m. EDT(2353 GMT) if all goes well. Here at LockheedMartin Space Systems near Denver, Colorado, "families and friends" of those thathave worked long hours over many years on the Phoenix project have gathered here in apacked conference room. Tension is high, as is hope. Missionoperators here are also monitoring the overall status of both the MarsReconnaissance Orbiter as well as the Odyssey orbiter now circling the redplanet. These two spacecraft will provide critical services during the Phoenix mission. Phoenix has turned off its navigation startracker as planned and is now flying solely on its own inertial measurementunit, NASA said. The next major milestone will becruise stage separation at about 7:39 p.m. EDT (2339 GMT), where Phoenix separates fromthe carrier that ferried it along its 422 million-mile (679 million-km) trek toMars. Clickhere for a guideof NASA?s Phoenixmission coverage this weekend. NASA?s Phoenix Mars Lander has successfully pressurized itspropulsion system for today?s planned landing in the Martianarctic. ?This is one of our critical events and it?s now behind us,?NASA commentator RobertShotwell, a project systems engineer at the agency?sJet Propulsion Laboratory where the landing is beingcontrolled. Withlanding approaching, NASA?s Phoenix Mars Lander is approaching its firstmajor milestone: the pressurization of its propulsion system to prepare for itsdescent to the Martian arctic.